The entry-level colour matching station. Now LED based.04 The entry-level colour matching station. 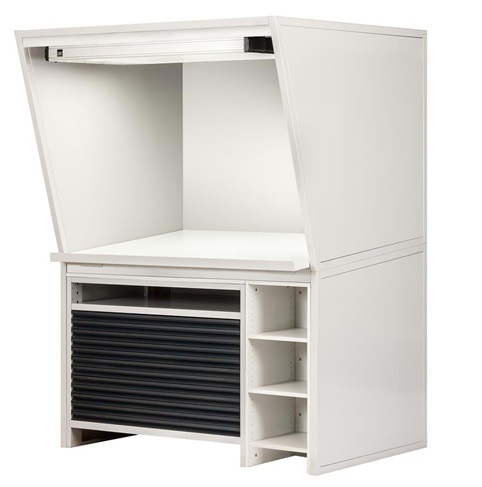 The classic colour viewing combination that consists of a colour proofing light and a cabinet for storing prints and proofs will now be extended with a transmissive lighting unit. Thereby standardised D50 lighting is available from above and below. Perfectly suited for colour assessments of large-format, translucent prints like in the labeling and packaging industry. The Duplex proofStation comes optionally with side walls to avoid ambient light. The standardised viewing area is up top 160 x 120 cm. The complete solution for the soft proofing workflow. Be it a Stand-Alone or Side-by-Side Station for parallel colour matching of multiple printed sheets – soft proofing could hardly be more convenient. From dimmable and switchable D50/D65 LED luminaire, monitor rails, all the way to a pull-out keyboard and a USB interface – they come with everything for reliable colour matching from prepress to press (Pat. No. US 8,592,748 B2). The classic colour matching station with a practical cabinet is now available with LED! Changing tubes is a thing of the past. The unique LED light technology enables you to reliably match colours over the long haul. In addition, the UV component required to new ISO standard can be deactivated with the simple touch of a button (Pat. No. US 8,592,748 B2). Available sources include the D65 (daylight) standard illuminant common in industrial applications, D50, TL84 (fluorescent store light) and A (incandescent/halogen light), all with very good spectral characteristics, a colour rendering index of Ra > 93 and a quality grade of BC or higher in accordance with CIE 51.2. An adjustable illuminance of 1000–4000 lux (1 meter height) and options such as smartphone or laptop control, and colour matching logs provide great flexibility. 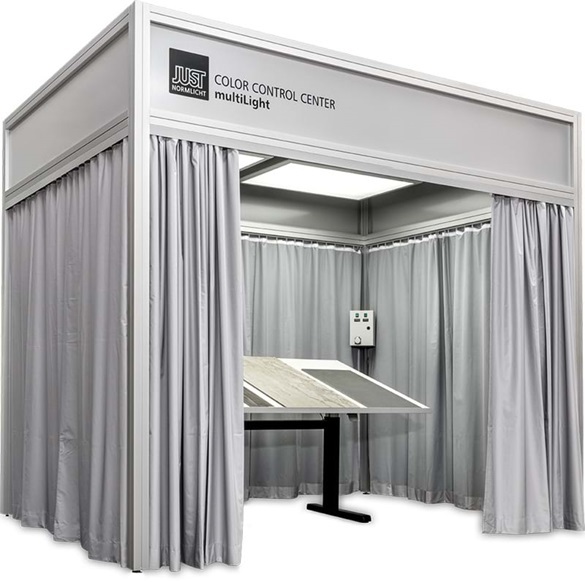 Viewing tables have adjustable height and angles while available surrounds for the Color Control Center include lightweight removable sliding doors, solid walls, or opaque curtains with a neutral gray finish. Even today, the general lighting situation in production shops and pressrooms still has a considerable influence on the colour matching of print products. Shielding against extraneous light and avoiding mixed light at the colour proofing station are essential prerequisites for ISO standard-compliant colour matching. 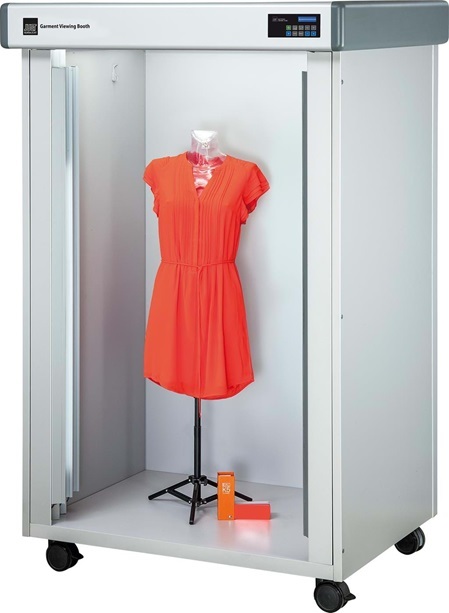 Both small companys and worldwide operating corporations use our viewing booths for visual colour assessment. Accordingly the requirements a different to a suitable viewing booth. The new Color Viewing Light series is available as an entry-level as well as for professional colour matching with a lot of useful features. The JUST daylight 6500 proIndustry is the heart of all D65 devices and has even better spectral properties than its predecessor. 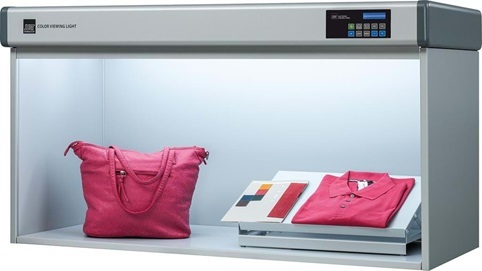 As a result, controlled, reproducible lighting conditions are possible for standard-compliant colour matching of a wide variety of materials in accordance with international standards. The D65 standardised light source has a minimum target colour point deviation of ±0,003 (x, y10°), a high colour rendering index Ra ≥ 98 and perfect values for metamerism; minimum class BC in accordance with CIE 51.2. The fluorescent lamp specially designed for JUST Normlicht complies with strict specifications in accordance with ISO 3668, DIN 6173-2 as well as ASTM D1729 for standardised colour matching. 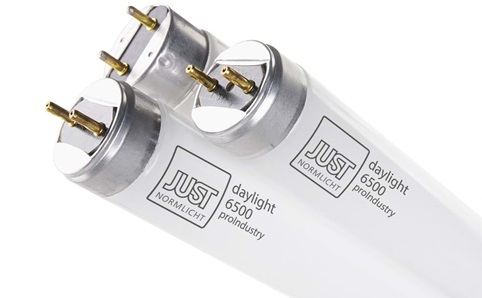 The JUST daylight 6500 proIndustry is available in different sizes und with 18, 36 and 58 Watt. A measurement report confirms the light quality of the unique fluorescent lamp with every delivery. 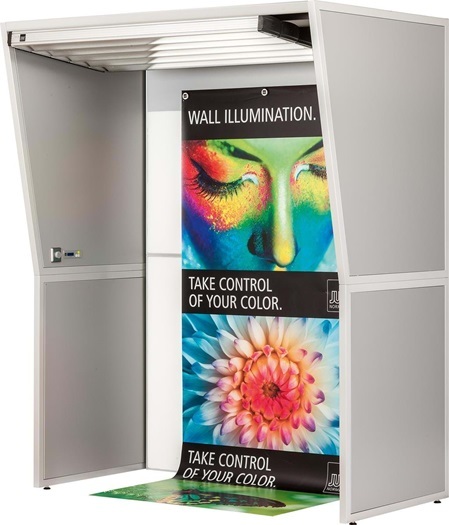 Because of a standard illumination area of 190 x 215 cm, the Wall Illuminator is suitable for colour proofing of large-format prints such as exhibition banners or advertising posters. Thanks to its size and accessibility, the substrates can be easily fastened with magnets on the back wall for colour proofing. The Wall Illuminator is available whether or not SPcontrol and dimming, and also available with dimmable backlight. The backlight makes it possible to examine the full area of backlit substrates, such as textiles or transparent print, against the light. All designs guarantee a standardised and a glare-free illumination across the entire back wall by the unique JUST moduLight technology. The monitor mount XT for 2 monitors enables either landscape or portrait orientation. The SPcontrol with USB interface and hour meter of the basic station also controls the dimming of the light of the extension stations. For soft proof applications, the SPcontrol coordinates the brightness of the JUST moduLight and the monitors to an exact luminance match. 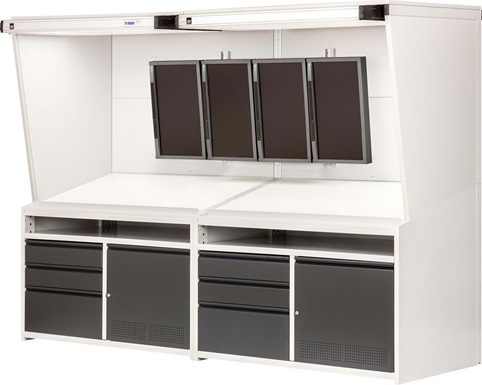 Each Virtual proofStation Side-by-Side BASIC is equipped with a sliding keyboard shelf, a vented storage cabinet and a bottom cabinet with plenty of storage space for printing tools. The colour of the side and rear wall of all large format solutions is Munsell N7 to permit neutral viewing. For colour matching of large-format prints with sizes 6B and 7B, the proofStations 30 and 40 Large Format can be individually equipped with shelves, storage cabinets and side shelves. A soft proof version is available, too. It is showing the printed sheet on rigid-mounted or sliding monitor. For this purpose features the proofStation for soft proofing a SPcontrol with USB interface, which ensures trouble-free communication with monitor calibration software packages. Therefore, the different needs and preferences of each individual can be better met. For applications in high-quality packaging and prints were taken care of, too. Thus, JUST Normlicht provide a UV proof light for both proofStations. Optical brighteners and fluorescent colours can be reliably assessed with them. 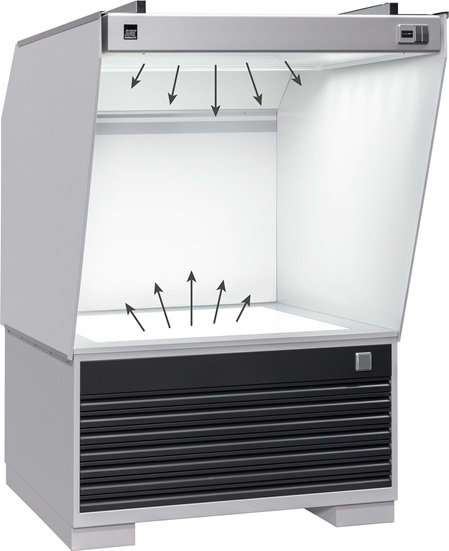 The proofStations 30 and 40 Large Format are also available as a multiLight version with four light sources (D65, D50, A and TL84) for colour control and evaluation of metamerism.